Cory grew up in Alaska where after graduation was nominated into the Olympic Education Center in Northern Michigan University where she was offered the opportunity to train for biathlon (cross country skiing and shooting) and go to college. Later she qualified for the United States National Biathlon Team and traveled and raced all over the world for over 6 years. Having been drawn to the outdoors all her life, McCall was a natural fit for her when she moved to the area in 1998. Cory’s lovely family consists of her husband, Jim, her son, Cyrus, daughter, Ellie and their Walker Coonhound, Copper and Cat, Twinkle. Cory and her family love to wake surf on Payette Lake, snowboard at Tamarack and Brundage Mountain, snowmobile in the back country, and mountain bike on all the amazing single track trails in the area. During the winter season, you will find Cory coaching the McCall Nordic and Biathlon team at Jug Mountain Ranch. Cory Corbet has been rated by 32 clients. “We had worked with Cory when we first bought the property we just sold. We had found her to be honest and hard working. We trusted her and wanted to work with her again. It was not an easy sale and the place had some challenges. Cory worked very hard and stuck with us and did a great job. I highly recommend her to anyone looking for an agent in this area. She is just a really nice person who does a really good job. I do not live in the area and this entire deal had to be done long distance. Cory made the whole process easy for me. “We loved working with Cory Corbet. She listened to our requirements and worked above and beyond to help us sell our condo and to make our offer on our ‘new’ home. She explained each process in detail and checked in with us often. We have recommended Cory to friends and will continue to do so. Cory saw that it all went flawlessly. “We got a opinion of value from a couple of other brokers, one was WAY TOO high and the broker not really able to back up his opinion and we got one that was well below what we would even consider selling for. Cory came in and gave us an opinion of value that we were a little unsure of, but she had the back up material. We stepped out in faith and low and behold, the house had a full price offer within 3 hours of the sign going on the property! Cory handled the whole process, from escrow to finding us repair people to fix the inspection concerns that the buyer brought up. “Cory went out of her way to spend the whole day with us looking at properties. Cory was very attentive, listened to what our wishes were and stayed as close to our price points as possible. We are so happy with our properties and look forward to moving to our new home in the future. “After thorough Internet research we selected Cory Corbet as the realtor we wanted to work with. We proceeded to a quick phone call to establish if our initial impressions were on the mark or off base. Cory quickly established herself as being extremely knowledgeable about the market locally and beyond. We met Cory in person via a brief visit over Spring break 2016 and on extremely short notice. Cory immediately made herself available along with several homes for our review. Cory quickly absorbed the various requirements we had for our future home and rapidly became our local ambassador in that pursuit. Cory walked us through the various steps for the state of Idaho and the area which was extremely important considering we moved here from North Texas. “Cory was a fabulous agent. I couldn't have been happier with my experience buying and selling a home with her. “We knew that Cory had shown our home several times when it was listed with another realty company. Cory was one of a very few who had left her business card after each showing, and that is how we knew she had shown our home and was familiar with it. 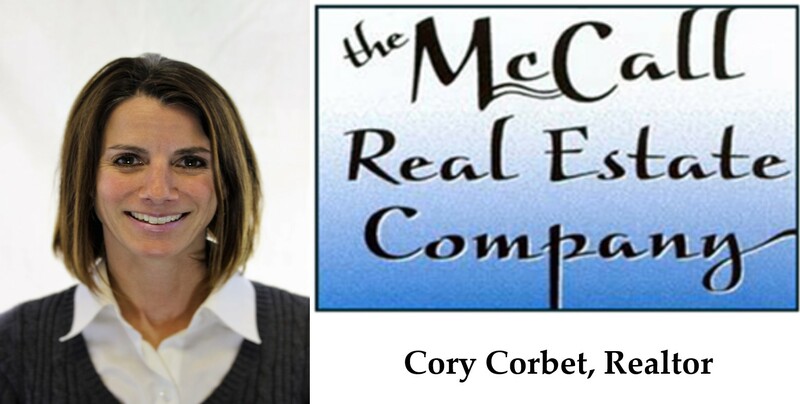 Cory is by far the most professional realtor we have dealt with in the McCall area. She was very knowledgeable about the comps and we knew she had done a lot of research when it came to pricing our home. Her timely communication was much appreciated, she always followed up on any showings of our home within 24 hours. Cory also addressed any concerns we had in a timely and professional manner. She took the time to answer any questions we had during the listing/selling process. “Cory exhibited an indepth knowledge of the entire area. More importantly she listened to our needs and found appropriate areas to investigate. “I have a great deal of respect for Cory as a real estate agent and as a person. As we went through the process of selling our fractional at Hearthstone she was realistic, encouraging, and helpful. Cory kept us up to date by sending emails relating to the economy, social events, and weather in McCall. She also kept in close touch about the McCall real estate environment and what was happening to the Hearthstone market in particular. Cory is patient, decisive, articulate, and knowledgeable, and we highly recommend her. She guided us through the closing process like a pro. Thank you Cory for a job well done.